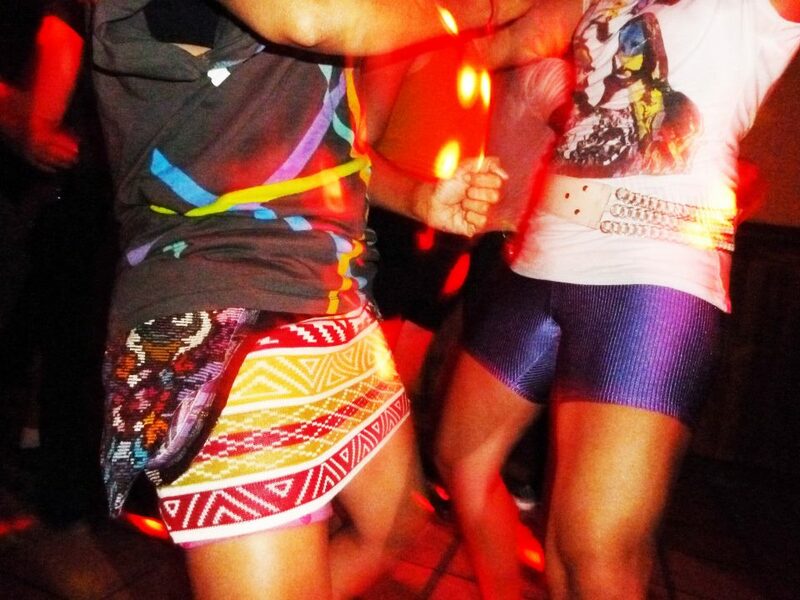 Kesta Happening » Blog » Maracuyeah Presents: Frikitona – DC's Queer Reggaeton DJ Duo! One of my first thoughts when the Maracuyeah Corazones Rebeldes III lineup for TONIGHT 10/24 at Judy's Restaurant in DC was announced was, who is Frikitona? Slated to round up the night of some awesome live performances by P3CULIAR and Malportado Kids, is the first Queer Reggaeton DJ Duo spinning right here in the DMV. I set out to talk to DJ Abichula and DJ Alex DB to get acquainted with their Frikitona baby. How did Frikitona get started? Frikitona started when we started DJing these parties that started at Phase 1 (Queer bar in Eastern Market) back in 2013, and it started because we didn’t hear the type of music that we liked when we went out to the club. We would go out to parties and we had a lot of friends that are DJ’s that were playing amazing music but nobody was playing the reggaeton that we wanted to hear. Especially the old school stuff it’s just not something that you hear a lot, and since it’s some of the best dance music in the world ever (laughs) we needed to start some cool parties and some cool queer parties so that people could dance reggaeton. Once we started the parties we realized people were also looking for a queer place where they could do partner dancing to salsa, bachata, and merengue. People would go crazy for it! So the parties became a place where there would be ladies dancing with ladies. Frikitona blossomed from a core of loving reggaeton to really becoming a space for queer people to be able to dance to the Latin music that they love. It’s a Plan B song. We like it, it’s a great song and Plan B is a great duo like us. We love the old school reggaeton but we also like some of the newer projects and Plan B is one of those groups that’s so consistent from Day 1. If you listen to the old mixtapes by DJ Goldie from 2003 they had the best songs on the mix tape and if you listen to the radio now they have the best songs on the radio too. We love Plan B but we also like what the name Frikitona means. It’s about being comfortable being different, being a weirdo, being queer, and being whatever you want. Do you have individual names also? As Frikitona do you DJ together or separately? Yes, we’re also DJ Abichula and DJ Alex DB. We’re a couple so together we DJ as Frikitona. In terms of our sets it depends on how long our set will be but we usually collaborate on sets and pick the music together and when we’re there we take turns depending on our mood. If we want to play we’re just like, “Hey can I get on now…?” (laughs). So you started with reggaeton and slowly started mixing in salsa and bachata. Do you only mix Latin music or do you play anything in English as well? It’s really only music in Spanish. We stick to our roots and I mean you can hear all types of music anywhere else. Like for example I like what plays on the radio, like Nikki Minaj and hip-hop but everyone else already plays that. So we want to uplift this music that we feel is underrepresented on the radio, it’s underrepresented at parties, and it’s underrepresented in DC. Abichula: I’m from Ohio and Alex is from the DMV and she’s Colombian. Did you both grow up listening to Latin music? Abichula: I started loving Latin music when I was staying in Cuba for a little while and Cubaton was the gateway drug for me. Cubaton means so much more than reggaeton from Cuba. If you listen to music from Cuba especially stuff from the Havana area it just has so much more of a distinctive and unique flavor, it’s really upbeat, beach party jams. Even the sad sappy romantic songs sound sunny. So yeah Cubaton was the gateway drug for me and I listen to Gente de Zona which everyone loves, Los Cuatro, Osmani Garcia and all those classic Cuban reggaetoneros. And Cuba and Puerto Rico are some of the many homes for reggaeton. Alex DB: I grew up listen to many types of music and my mom is from Colombia so I grew up listening to a lot of cumbia, salsa, some reggaeton but usually Don Chezina, earlier Plan B, Tego Calderon, and honestly it was Abichula that rekindled my interest in Latin music. After learning how to dance for real with her even I’ve been impressed with how vastly my dancing skills have improved in the last year. That must be awesome working with your partner? Abichula: I would say that working on projects together has been one of the best things about being a couple. Alex taught me how to DJ and I kind of taught her more about Latin music. Alex DB: She definitely rekindled my interest for sure (laughs). Recently DJ rAt of Maracuyeah put out a call for the banding of female DJ’s and supporting each other by sharing skills and participating in workshops how do you feel about that and are you participating? Abichula: Yes! I love living in a world where we know so many woman DJ’s. There is so much truth to that stereotype that it’s a male dominated world, just go to any club and you will only see male DJ’s behind the decks. But I feel so lucky to know so many woman DJ’s and in my world and perception the stereotypes are not true. It’s a great community to be a part of, everyone knows different people, knows about different types of music and so I love that. Alex DB: I also think that specifically creating a space and equipment shares and things like that allows for different members of the community to hone their skills and practice. It’s a super expensive habit so we need to find support however we can! How big is DJing in your life right now? Abichula: I do it more on the side. I only do Frikitona I don’t play top 40 music or hiphop or do any parties that are not Latin Music. Alex is a different story. Alex DB: I was a member of She-Rex and have also guest DJ'ed with Anthology of Booty. I’ve been Djing in DC for 6 or 7 years now, pretty much all part-time but I’m basically trying to do it full time now. It’s really exciting to forge relationships with other DJs and kind of get creative with it. That’s why I’m really excited about this event on Friday and just being able to revamp our project. Another reason we’re especially excited about DJing this party is that all of the artists are really mindblowing Latin music that you just don’t find anywhere else in the scene. So it’s a party for everybody but it’s going to be especially awesome to have this party with our big queer family and invite everyone else and just bring the house down. Tell me more about why it's important to support queer partner dancing. DJ Alex: It’s important because if you’re at a random place and there are two women dancing the assumption by most people is that it’s not a partner thing and that can lead to issues. Abichula: For years I would go dancing salsa, bachata, and merengue and you just can’t escape the fact that guys are going to ask you to dance every moment that you’re at the place. There is the assumption that if you’re dancing you will say yes and if you say no people get angry and take it personally. Once people get offended it makes it so hard to deal with, so it makes it so hard to just go out. Sometimes I was going out with people I was dating and while we were dancing guys would just assume that we just didn’t have a guy to dance with and they tap you on the shoulder and interrupt you. There’s also a reluctance if you’re dancing with another woman you are probably going to get unwanted attention, people are going to want to stare at you or talk to you or assume that you’re doing it for attention. So for all these reasons it’s nice to have a place where queer partner dancing is the norm and the assumption and everyone else is welcome. So what can people expect for your set? Reggaeton! But we’re going to play salsa, tribal, and a lot more in just one hour! Follow Alex DB on Facebook. Also off the record… (laughs) we’re probably going to get the party started again before the end of the year.. So stay tuned! In the next couple of years we’re just going to continue creating spaces where people can come and feel comfortable with queer partner dancing. Frikitona just dropped a new mix called Frikkiliiks (best name ever!) to get you hyped up about their upcoming set at Corazones Rebeldes tonight 10/24 at Judy's Restaurant!! Check out Frikkiliiks here: http://mixcloud.com/alexdeebee/frikiliiks/ and bring your dancing shoes tonight! DJ rAt of Maracuyeah weighs in on Corazones Rebeldes III! Tell me why this lineup is sooo badass?! What can people expect from this tercera edicion of Corazones Rebeldes? DJ rAt: The lineup is amazing right? 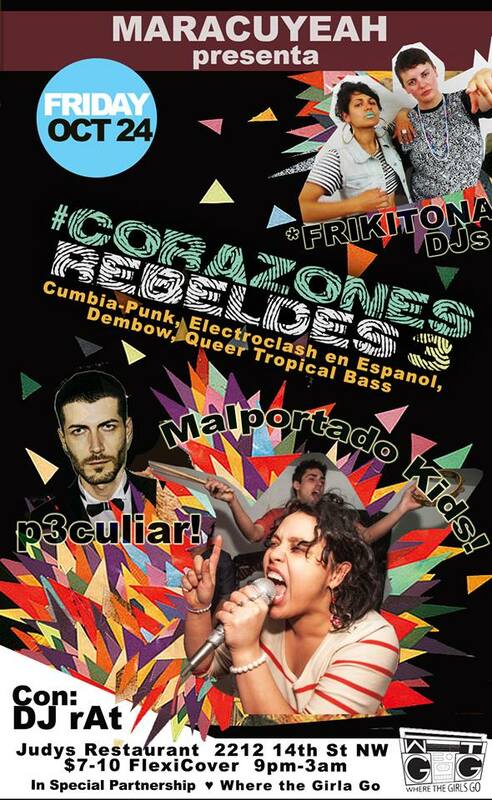 Our previous Corazones Rebeldes parties have focused on badass DJs- like Nolita Selector & Apuesta Por El Rock. For this party we are taking it to another level & inviting both DJs AND live bands that embody that spirit. For us the idea of "Rebel Hearts" is about sincere expression with all our complexities and no apologies. It's about making our own rules & building what we want to see around us. And it's about wild dancing como quieras on the dancefloor- of course with mad respect. It will incorporate even more genres than usual, including queer reggaeton, rock, and some exciting throwback. The partnership with Where the Girls Go makes awesome sense, is this the beginning of a beautiful friendship? DJ rAt: Yes we are super excited about the partnership! It comes out of a relationship with Alexander one of the main organizers of Where the Girls Go (WTGG) – He just got back from visiting Bolivia after a long time. We have always shared a passion for weirdo Latin underground culture that also embodies and celebrates our queer identities and community. And that’s what Maracuyeah has always been trying to do. We admire what WTGG does and invited them to join as a special partner- super excited, it should be a really fun experiment! What is the Maracuyeah playlist sounding like for this party? Sneak peaks for favor! DJ rAt: We will have booty beats, hyperactive tropical sounds, cumbia in all its mutations as always, some indie y rock'n roll, plus throwback sing-alongs and Latin sound experiments that are beyond even our enthusiastic descriptions. Expect Selena (love that Malportado Kids also love her- she’s a Maracuyeah community champion) A special Rita Indiana remix. La Delfi who we never stop sweatin’. Some Oscar Nñ edits. Demphra. Lido Pimienta. Titica. Ana Tijoux. Diomedes Dias. Aroma. Lisa M. La Insuperable. 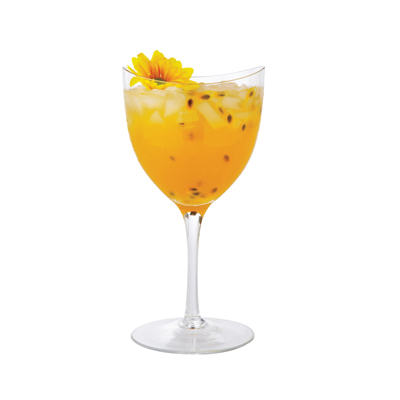 Amanditita. El General in our own style. Kumbia Queers. Maria Teta. Wachiturra/os. Santos. Mamacita. Heres a little playlist we made with special contributor Maria Alejandra. Also just have to add we will have real Maracuya juice (passion fruit) cocktails early in the night ‘til supplies last, and are giving several away from 9:00-10:30!